It’s hot, but you have to make dinner tonight. 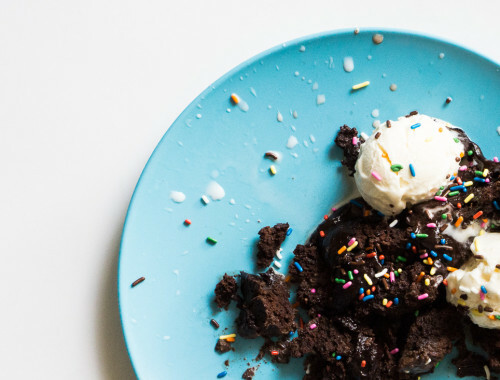 You don’t want to spend time slaving away for hours to make dessert, yet you still want something more interesting than just plain fruit and cream. I have just the recipe for these hot days: a parfait consisting of sugared, orange-scented strawberries, layered with whipped cream and vanilla ice cream. 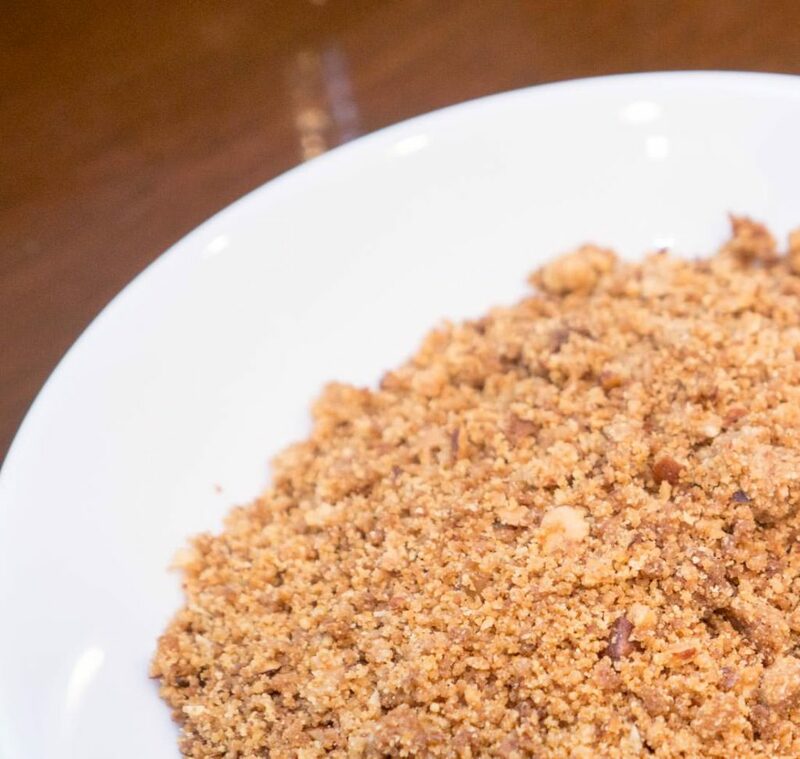 What takes this dessert from ordinary to extraordinary are sbrisolona crumbs: crumbs from an Italian cookie that is crunchy with almonds and semolina flour and infused with orange flower water. 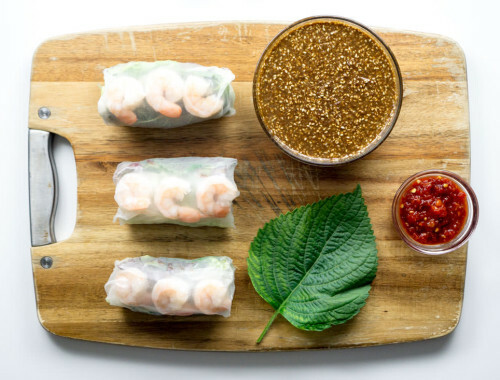 This recipe originates with the ultimate restauranteur-with-the-heart-of-a-pastry-chef, Nancy Silverton. When Nancy first opened Pizzeria Mozza at the corner of La Brea and Melrose in Los Angeles, I would order the justly-famous butterscotch pudding every chance I got. Creamy, salty, and slightly tangy from the creme fraiche, the pudding haunted my dreams at night. 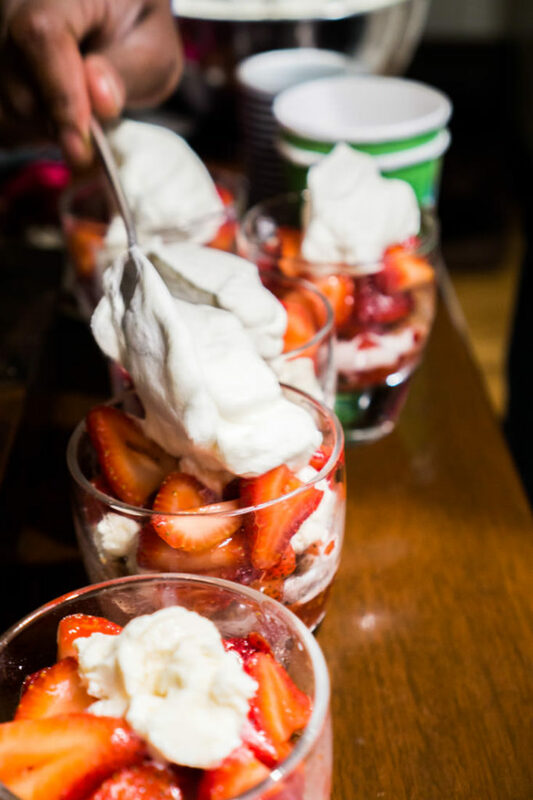 Until I discovered the fruit coppettas, which feature fresh fruit (usually apricot, sometimes strawberry) tossed with sugar until the fruit softens, layered with dense gelato, a cloud of whipped cream, and crunchy crumbs. On the surface, the fruit coppettas seem so basic. But Nancy and Dahlia know how to make the simple extraordinary. 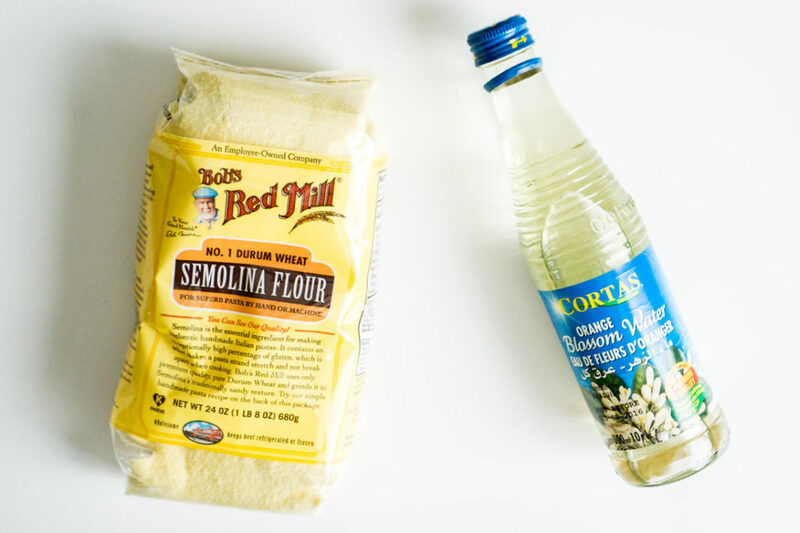 Nancy and her pastry chef, Dahlia Narvaez (both of whom deserve all the accolades that have been heaped upon them over the years) are brilliant at perfecting rustic desserts with a tweak here, a tweak there. So extraordinary, in fact, that while in-season fruits taste best, you can even use less-than-perfect strawberries in this recipe and it will still taste delicious. If you can use even mediocre strawberries in this apparently-simple dessert, then why does it taste so compelling? The crucial component of the strawberry coppetta, the game-changer, is…the crumbs! 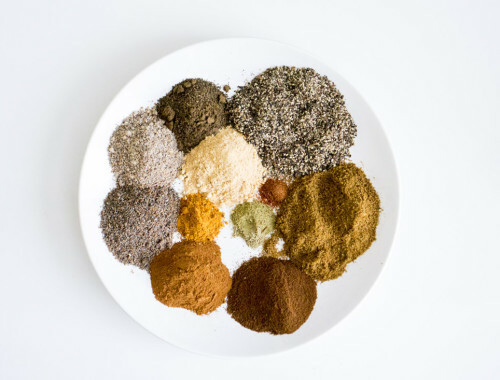 Nancy Silverton understands, on a deep and fundamental level, that the devil is in the details. Featuring not one, not two, but three kinds of crunch (a basic crunch from the mix of wheat flour, eggs, and butter, a secondary softer crunch from the almonds, and a third, unexpected crunch from the semolina flour), and scented with orange flower water, the crumbs taste all at once exotic and utterly familiar. Although I didn’t know what was so special about what I was eating at the time, the sbrisolona crumbs made me a do a double-take when I ate my first coppetta (apricot coppetta, during the summer of 2012 or 2013). 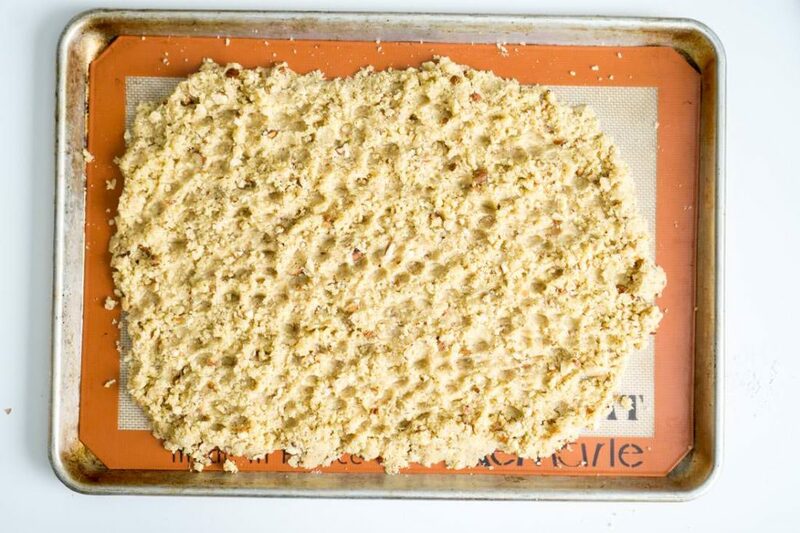 Sbrisolona crumbs take a basic dessert and make it extraordinary. 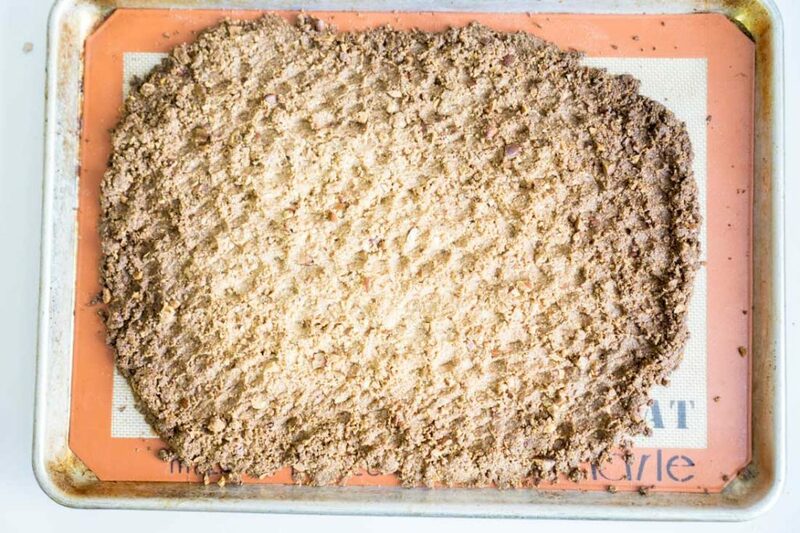 The recipe is a bit exacting, but following the instructions faithfully will give you a large batch of nutty crumbs that will give you more than what you need for your evening dessert. You can sprinkle them on your next morning’s yogurt, on oatmeal…or just eat them out of hand. First, clarify your butter. 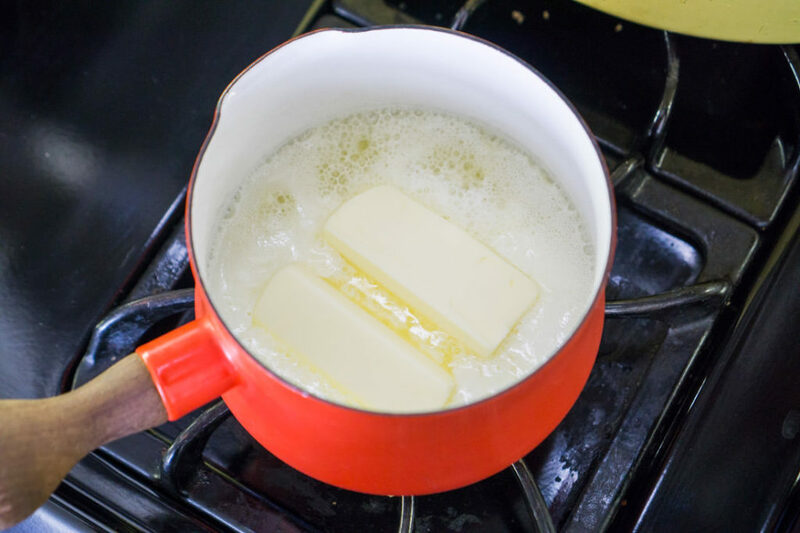 “Clarify” is just a fancy word for heating up your butter until the milk solids separate out. 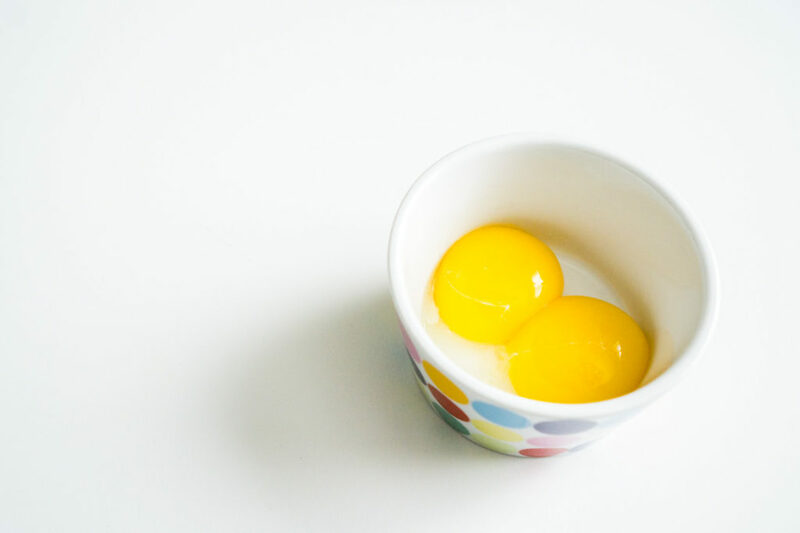 Measure out the rest of your ingredients, including 1.5 egg yolks. Don’t worry about getting this exact; just eyeball the measurement. Process toasted and cooled almonds with sugar, the egg yolks, the clarified butter, and some orange flower water. It will smell amazing. Rejoice and try not to eat the bowl of crumbs. Bake the crumbs, but try not to burn them, like I did. 🙁 If you do burn the crumbs, pick out the unburned parts and carry on like nothing happened. Once you have all the components ready, assemble the parfaits. The ice cream melts fast, so don’t dilly-dally. Adjust the oven rack to the middle position and preheat the oven to 325 degrees. Spread the almonds on a baking sheet and toast in the oven until lightly browned, about 10 to 15 minutes. Shake the pan halfway through to ensure that the nuts toast evenly and to check that the nuts are not browning too quickly. Cool, then coarsely chop half of the almonds. In a small saucepan, clarify the butter by heating it over medium-high heat until it boils with large, loud, rapidly bursting bubbles. Turn the heat down to medium and continue cooking about 5 to 7 more minutes, without letting it brown, until the butter becomes foamy and the bubbles are fewer and quieter. Remove from heat and transfer to a bowl to cool. Skim the foam off the top and pour or spoon out 2/3 cup of the clarified butter, leaving the milk solids at the bottom of the bowl. Refrigerate any leftover butter for another use. 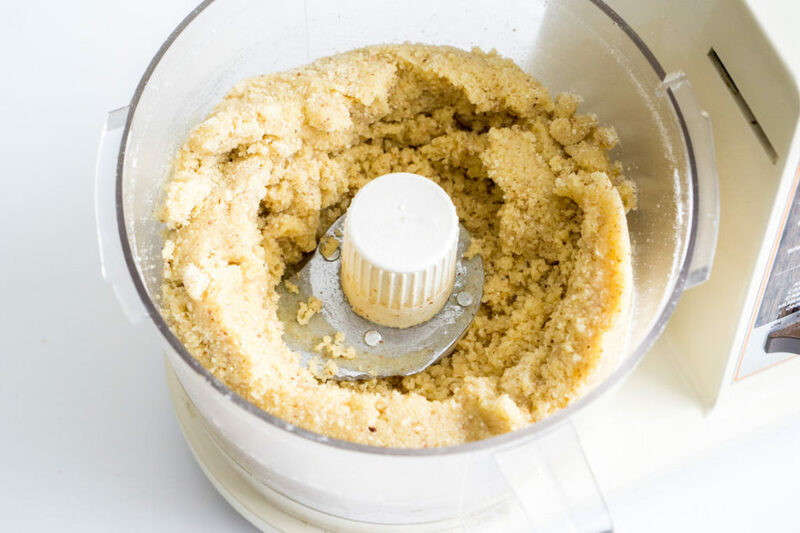 In the bowl of a food processor fitted with the steel blade, combine the whole almonds with half of the granulated sugar and process until it's the consistency of fine meal. Add the remaining sugars, flours, and salt, and pulse to incorporate. 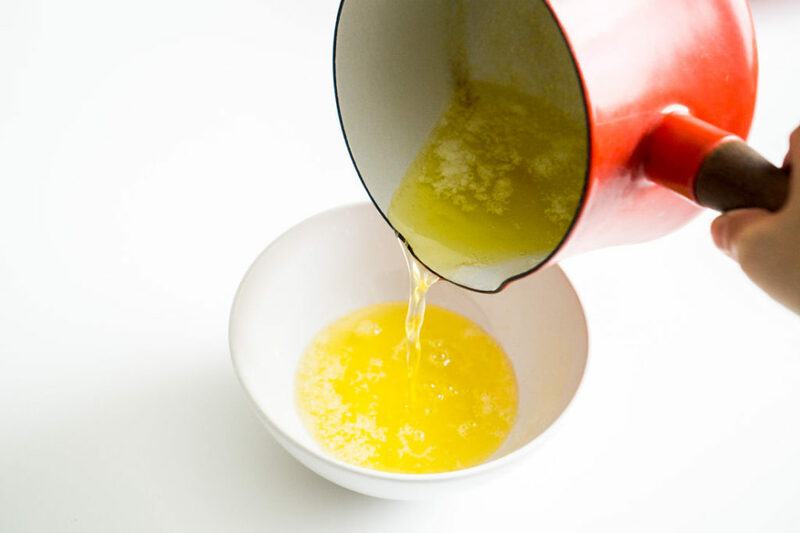 Add the egg yolks and orange flower water, and pulse just to combine. Add the 2/3 cup of clarified butter and pulse on and off a few times until the mixture is just moistened, but does not come together. Transfer the dough to a mixing bowl and toss in the remaining chopped almonds. Line a baking sheet with parchment or a silicone liner. Pick up a handful of dough, squeeze it together lightly in your fist, and crumble it, in large chunks, onto the baking sheet. Continue a handful at a time, crumbling the remaining dough. Bake for 20 minutes, rotate the baking sheet and bake for another 20 minutes until lightly brown and firm to the touch. Do not overbake this, or else you will lose the delicate taste of the nuts and orange flower water. Cool completely and break up into uneven chunks. 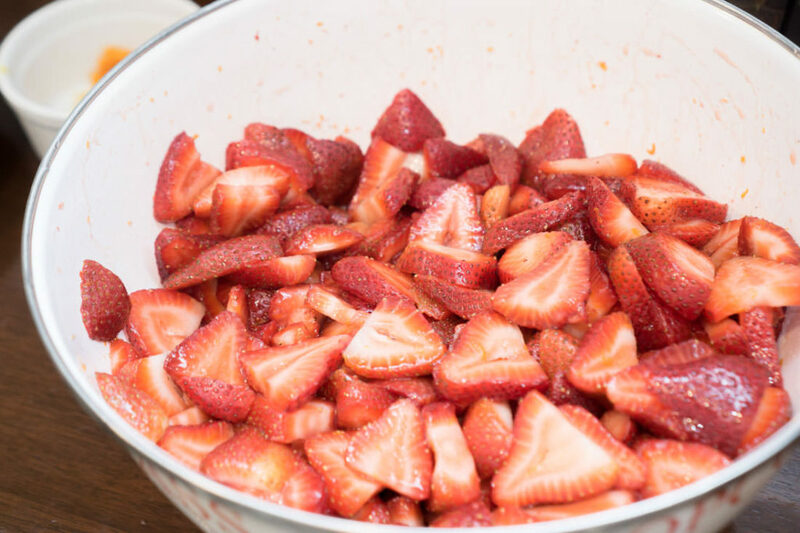 In a medium-sized bowl, combine the strawberries and sugar. Using a microplane, zest the orange over the strawberries. Toss together with a spoon and set aside until ready to use. 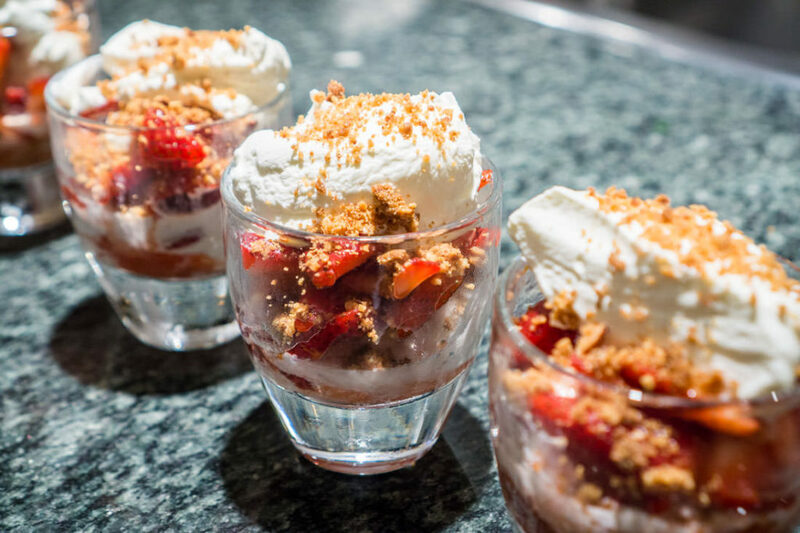 In an 8-ounce glass or mason jar, build the parfait as follows: start with a layer of sbrisolona crumbs at the bottom of the glass, and then add a small scoop of vanilla ice cream and a layer of strawberries. 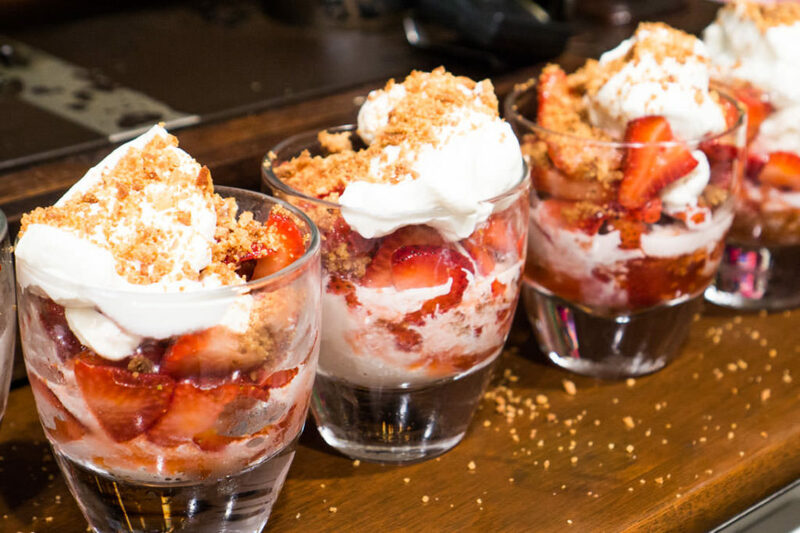 Repeat, layering the crumbs, ice cream, and strawberries until the glass is nearly full. Top the parfait with a dollop of creme fraiche whipped cream and garnish with a sprinkling of the reserved chopped almonds.